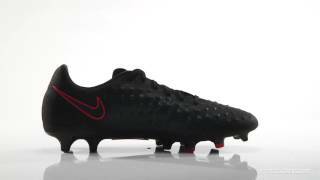 The fourth tier of the Nike Magista Range is the Nike Magista Onda II. In the past boot manufacturers haven’t spent time and resources on producing lower budget models of their top boots, however with the Onda Nike seem to have bucked the trend. A variety of material used on the Onda are similar to the more expensive Magista options, whilst some performance features have also been borrowed from the top level models. The Onda’s main similarity to the Magista Orden is the synthetic leather used on the upper. The Onda also offers ball control enhancements from the all over textured material, which Nike claim amplifies ball touch. 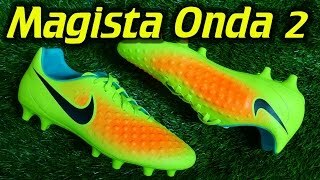 Although the Onda features a similar design of the bumps (for ball control) on the upper, they are not as defined as the top level Magista’s, therefore have less effect in a game or training situation. 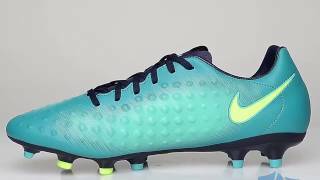 The Magista Onda has the same TPU stud construction as the more expensive Magista Orden, however that is where the soleplate similarities stop. Unlike the other Obra II, Opus II and the Orden – which all have a clear outsole, the Onda has a solid Black (or white) base which blends into the coloured tip studs. 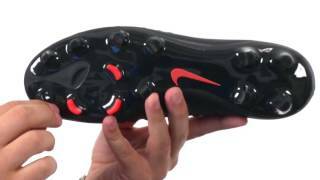 Although this may not play a huge amount of difference in your performance on the pitch, we have to the say the clear soleplate is a little more ascetically pleasing to the eye, although, for a budget football boot, Nike has done a great job with the Onda. Retailing from £60, these are a great option for style-conscious beginners or youth level players. 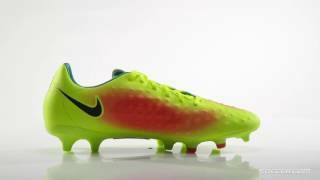 If you are looking for a cheaper boot in the Magista range than why not try to Magista Ola. It is the entry level boot for the range with prices starting from £40.